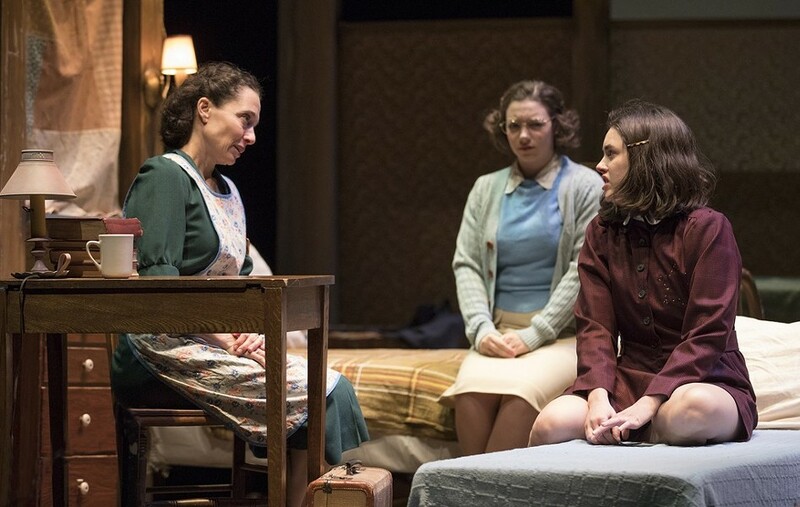 Tim Fuller Naama Potok, Devon Prokopek and Anna Lentz in ATC’s The Diary of Anne Frank. There's a scene in the Arizona Theatre Company's production of The Diary of Anne Frank in which one of Anne's housemates, Mr. Van Daan, asks her what a 13-year-old girl could have to write about all the time that could possibly be so important. Anne's sister, Margot, usually the picture of non-confrontational composure, snaps her head up from her studies. "Just because someone is young doesn't mean they don't have anything to say, Mr. Van Daan," she responds. Devon Prokopek, a University of Arizona senior and Arizona native who plays Margot, says this is her favorite of her lines in the show. "You can see that there is a fire behind what she wants to say," Prokopek says. "Margot only speaks out like that when she feels there's a deep injustice." It's hard to sit through the play and not see how lines like that one echo across the decades and into the present. Take Stoneman Douglas High School student and gun control activist Emma Gonzalez, who wrote a piece for Harper's Bazaar. "We are children who are being expected to act like adults, while the adults are proving themselves to behave like children," she writes. "When did children become a dirty word?" The Diary of Anne Frank, based on the book of the same name, tells the story of two Jewish families—the Franks and the van Pels (called the van Daans in the play and Anne's original published diary)—and one Jewish dentist going into hiding during the Nazis' occupation of the Netherlands in World War II. Anne's diary, which details the life of the group as well as her own feelings and aspirations, was later discovered by her father, the only one of the eight members of the group to survive the war, and published. Today, it's been translated into dozens of languages, and the secret annex is now a museum called the Anne Frank House. Prokopek is Jewish, as is Naama Potok, who plays Anne and Margot's mother, Edith Frank. But whether the cast members were Jewish or not wasn't important, Prokopek said, especially considering that the Frank family wasn't particularly religious. "The thing that's interesting about this show is that it isn't about Judaism," she says. It is a play about the dynamics between a group of people who must spend all of their time together, and all of the annoyances and hardships and even fights over whose turn it is to use the restroom that come with it. Because before they are people in hiding, or people growing thinner by the day, or even people who are Jewish, the characters in this play are, first and foremost, people. People have a tendency to fall in love, to make one another gifts for holidays, to search for hope when it is hard to find and to celebrate good news. If they are adolescent girls, they tend to argue with their mothers. "[Anne] represents all young girls who get stuck in a situation," Prokopek says. Prokopek herself remembers reading the book for the first time in fifth grade, and empathizing completely with Anne: the injustice of her mother comparing Anne to her older sister, the injustice of having to share a room with a grumpy old dentist, the injustice of not being able to look stylish in front of her crush. All compounded by the injustice of facing persecution for something which she could not control. Now that she's older, Prokopek (and likely audience members who haven't revisited the story since they were children themselves) empathizes much more with the mother Anne loathed so much. The injustice of having to share such a small space with people who weren't always considerate, the injustice of having to make do with whatever scraps were there every night for dinner. The injustice of having to force this all on her children, and not have the words to explain to them that this was hard for her too, that this isn't what she wanted either. All compounded by the injustice of facing persecution for something which she could not control. All of the actors are on set for the entirety of the show. They exit during the first half of intermission to change and grab sips of water, but even during the second half of the 15-minute intermission, they return to stage in character and quietly go about their lives in the annex. The whole point of the show, says Prokopek, is that they can't escape. Well, not physically. But, as the characters in the show remind us, sometimes solace can be found in the chance to read a book. In an old fur coat. In a cup of coffee. In the chance to write down your thoughts and feelings. Or, as Anne Frank once wrote in her diary, in looking out the window. "Whenever you're feeling lonely or sad, try going to the loft on a beautiful day and looking outside. Not at the houses and the rooftops, but at the sky. As long as you can look fearlessly at the sky, you'll know that your pure within and will find happiness once more."